Kate and Wills are never out of the spotlight. The former in particular, from her attire and whether it's a 'recycled' outfit (read: worn before, believe it or not for one crazy minute) to her parenting skills. From the moment their children were born, the whole world has watched their every public move to see what they're like as parents. How involved is William? Is Kate an attachment mummy? How well behaved are their little cherubs? Do you remember the joyful scrutiny the media gave to Wills trying to fit the car seat when picking up Kate and their new sprog from the hospital? Bless him. What I liked about this moment was how William was just like any other new father - clueless, worn out, overwhelmed - but unlike most dads, he had the whole world watch his every move as he tried to fix those pesky, fiddly clasps. And we've been given a glimpse at the realities of parenthood, royalty or not, again. 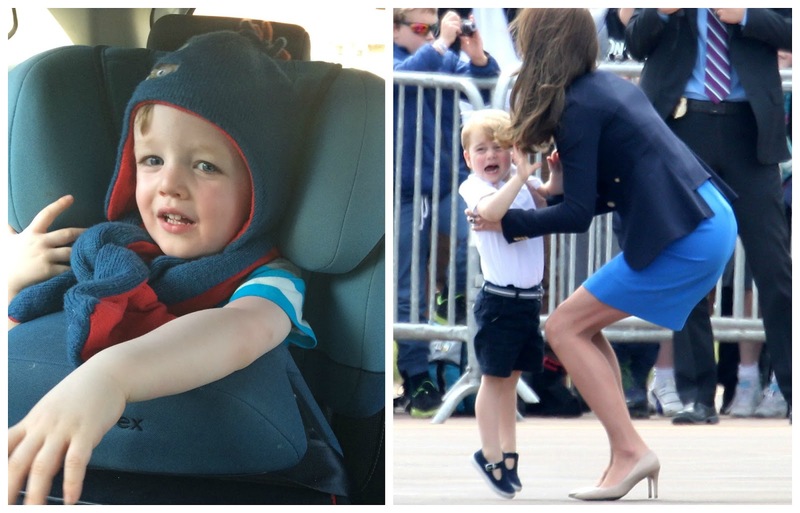 When visiting the International Air Tattoo, Prince George decided not to play ball and, as the media termed it, he had an 'attack of the terrible twos!'. Fancy that? A toddler who didn't want to be dressed up, trotted out in public next to a noisy aeroplane. He'd probably much rather be watching Mr Tumble. This comment made by the Daily Mail made me smile: "After arriving the normally impeccably-behaved youngster threw a tantrum before being picked up by his mother." Left: my little cherub, upset with me because I said he didn't need to wear his winter hat and scarf - as it was the hottest day of the year. 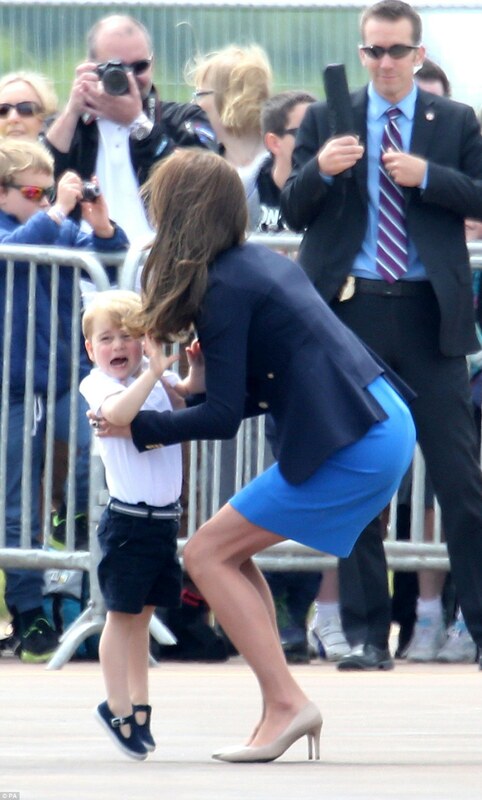 Right (source): the future King of England, giving his poor mum Kate the run around - and in those heels, too. Prince George? A normal toddler? Bah! I think all mums can relate to what Kate must have been feeling in that moment. A flush to the cheeks, the feeling that everyone's eyes are on you, judging you as a parent - except, in her case, she knows they really are. It's a miracle that Prince George has put on such a perfect performance to date (remember his baby group meeting where he started to crawl, wearing those cute as anything dungarees?). And I bet Kate holds her breath every time they step out the door to go to some engagement or another. Little do we know, but angelic little George has just thrown his spaghetti hoops all over the floor. Or had a wobbler over being given the wrong colour cup. Probably. And the reason why Kate is often spotted wearing something she's worn before? 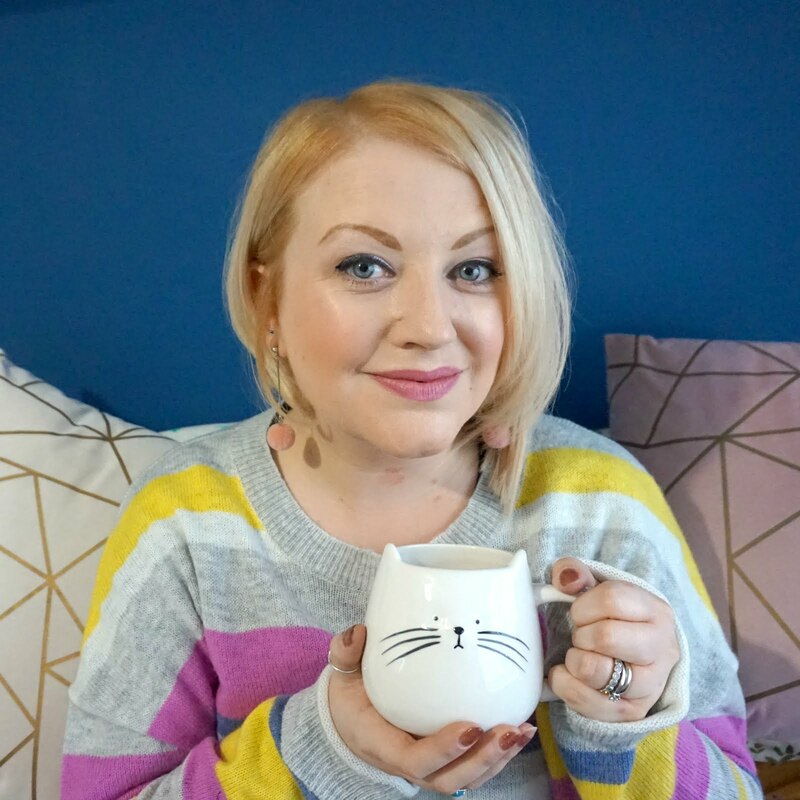 It's because all mums have their go-to, safe outfits; the ones they feel comfortable in, can just throw on and go, and probably know there's no toddler snot on it... just yet. The press like to pick celebs up for mistakes, from wardrobe fails to spotty chins. We all like to find a fault in a somewhat other seemingly faultless life. The great thing about William and Kate is that behind everything, they are parents to two children. They may lead a very different life to the rest of us, but even they are subject to toddler tantrums - just like their royal subjects, you and I.
I agree completely with all of this. You can't expect someone to be perfect but part of growing up is learning to control these - even when out in public. Brave decision for Kate to take him but probably the right decision in the long run.